Modern Land Battles allows you to command Armour, Infantry, and Artillery forces on the world's battlefields from the 1970's to modern day. Play out a Soviet vs. NATO battle in the 1980's, or a US vs. Iraqi battle in Desert Storm, or an unlimited number of other battles anywhere in the world! 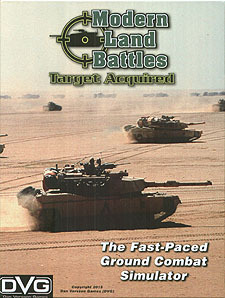 Modern Land Battles< includes the world's finest land forces from the United Kingdom, Soviet Union, China, Arab Multinational, Israel, Insurgents, United States, as well as 90 Action cards to fire your Cannons, launch Missiles, and protect your forces in battle. You must decide how to use each of your cards to best attack your enemy's formation, while defending your own. Modern Land Battles is a Multi-Player Game. You and up to 5 of your friends get to select nations, make tension-filled battle decisions, and decide the fate of the war!